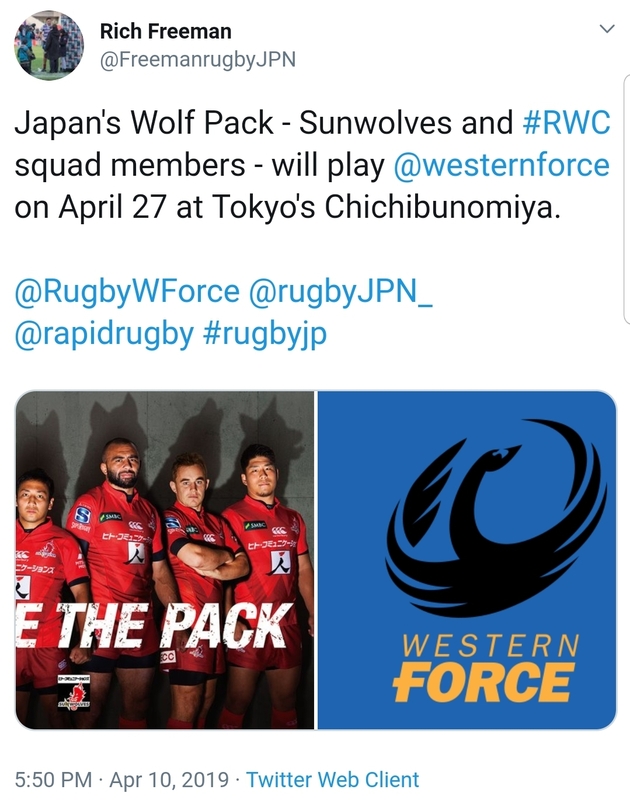 Japan's Wolf Pack - Sunwolves and #RWC squad members - will play @westernforce on April 27 at Tokyo's Chichibunomiya. Hell yess... thats in a few weeks!! I wonder who is broadcasting it. Wish I could go to that, missed out on the last one. Japan and the Pacific Islands for Aussie Super 9's! Let's have one of these in WA! Click this link: Saitama Super Arena - New Perth Stadium? Would certainly add something extra to GRR for next season. Ditto. Hopefully Viceland can pick up the telecast from somewhere. It would be ridiculous if this game wasn't on local TV. Someone with an ipad at the game? Nonprobs. Western Force will play Japan ‘A’ in a two-match tour before their next Global Rapid Rugby clash in Singapore. They kick-off the tour against a combined Sanix Blue and Coca Cola Red Sparks side in Fukuoka next Sunday before taking on the Japan side, nicknamed the Wolfpack, in Tokyo six days later. They play the Asia Pacific Dragons at HBF Park tonight and the return clash will be at Singapore’s Queenstown Stadium on May 12. Force coach Tim Sampson said the tour would be a big learning experience for the team. “We are very fortunate to be able to travel to a wonderful place like Japan and play against quality opposition,” Sampson said. Sampson said the two matches would provide good preparation for the next GRR game. “The two fixtures will be challenging. It will be an ideal lead into our third showcase series fixture,” he said. Hopefully they broadcast Japan A too. Two company teams in the region actually combining, to create an ersatz Fukuoka XV to take on the Force?! Could this be the forerunner of a possible Kyushu franchise in GRR?! I can't believe it! I'm getting a bit over-excited maybe, but this could be something big. Are we watching the Force take on both of Japan's GRR teams in their prototype stages? Where's Nick Marvin? Come on, Nick! Let's get the news out there! Imagine not being able.to watch these two games with all the intrigue around them. I mean I would be happy with one of those NRC cameras set up on the top of the hill with only the one fixed camera for the bulk of the game, even if this was only streamed on the website over not being able to watch these two games at all. Note: if they dont broadcast it can one of you Force fans [preferably Sheikh as he doesnt yhink its a big deal for Force fans to be expected to fly to Japan to watch this and is quite happy it isnt on TV so we can try boost Japanese crowd numbers and get to the game] fly over to Japan and live stream this on facebook for us. Maybe get 2 airplane tickets to both destinations. The Badge played for Coca Cola and was at the game last night, wonder if he is actually being paid by Twiggy for his endorsement of GRR. 80 Minutes, 15 Positions, No Protection, Wanna Ruck? Ruck Me, Maul Me, Make Me Scrum! Education is Important, but Rugby is Importanter! I hope so TIF! If they can’t see the marketing value in having the Badge’s face everywhere, they have a problem! Hopefully he's on a retainer to get into shape for a full contract next year. All times are GMT +8. The time now is 18:54.